Next up in Sundance’s 2015 US Documentary Competition: BEING EVEL, Daniel Junge’s chronicle of the life and legend of the famed daredevil. After an adolescence riddled with petty thievery and general rabble-rousing, Knievel set his sights on superstardom, a feat he achieved when televisions around the world aired the startling crash footage of his 1967 attempt to jump the fountains at Caesar’s Palace in Las Vegas. The jump was spectacular, but the failed landing that sent him skidding like a ragdoll across the asphalt was the main attraction. 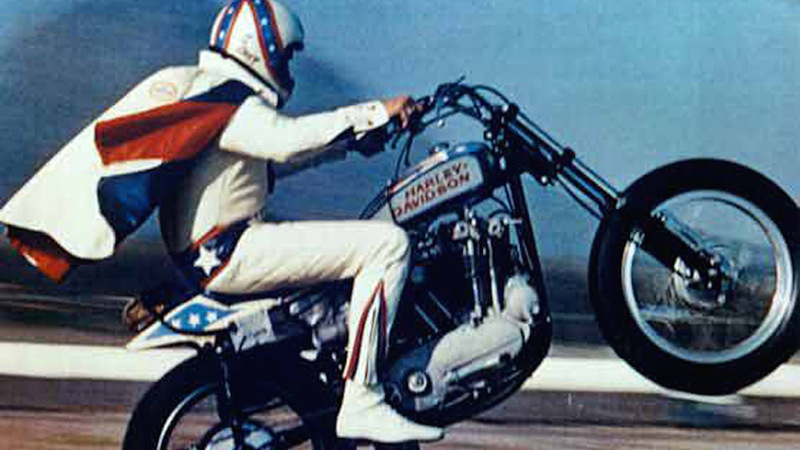 Throughout the 1970s, his legacy as King of the Daredevils spawned action figures, movies, and a generation of kids who wanted to be just like Evel. Featuring insights from current action sports superstars who were inspired by Evel’s iconic career, Academy Award-winning director Daniel Junge immerses you in a life story so incredible that you’d swear it was a tall tale. This is Daniel Junge’s sixth feature doc, and his first to screen in Park City, though he has received Sundance Documentary Film Program support for his previous film, IRON LADIES OF LIBERIA (2007), which debuted at Toronto. Other features have premiered at SXSW and Tribeca, while his short films have twice gotten Oscar attention – THE LAST CAMPAIGN OF GOVERNOR BOOTH GARDNER was nominated, while SAVING FACE was the winner of the Best Documentary Short Subject Academy Award. Joining Junge as producers are Johnny Knoxville (JACKASS, Sundance alum GRAND THEFT PARSONS (2004)), BMX pro Mat Hoffman, Justin Moore-Lewy (Sundance alum as executive producer of SLEEPWALKING (2008), Jeff Tremaine (who has collaborated on Knoxville’s JACKASS oeuvre, and Brendan Kiernan (producer of Junge’s recent BEYOND THE BRICK). Davis Coombe, a Sundance alum as editor of CHASING ICE (2012), serves as co-producer and editor. Executive producers include A&E IndieFilms/The History Channel’s Molly Thompson, whose Sundance credits include fellow 2015 titles CARTEL LAND, DRUNK STONED BRILLIANT DEAD: THE STORY OF THE NATIONAL LAMPOON and LILA & EVE, as well as HAPPY VALLEY (2014), UNDER AFRICAN SKIES (2012), MAGIC TRIP (2011), CORMAN’S WORLD (2011), THE TILLMAN STORY (2010), THE SEPTEMBER ISSUE (2009), and AMERICAN TEEN (2008); Thompson’s History Channel colleagues Susan Werbe and Dirk Hoogstra; actor George Hamilton, who famously produced and starred in the 1971 biopic EVEL KNIEVEL; Kelly Knievel, Evel’s elder son; and Robert Lewis. Junge adroitly captures the showman’s appeal – and sometime contentiousness – in a wealth of archival footage spanning Knievel’s career, while interviews with those who knew him best – including his younger son, Robbie, who followed in his father’s stunt-riding trail – tell the story behind the publicity-seeking. No simple nostalgic look back, the film also posits the stuntman at the genesis of modern action sports and gives him his due. While there’s no standalone website for the film yet, Junge’s site may be found here. For Junge’s thoughts on the film, watch his Sundance Meet the Artists profile and check out his Indiewire filmmaker interview. For screening dates and times at Sundance, click the link in the first paragraph.